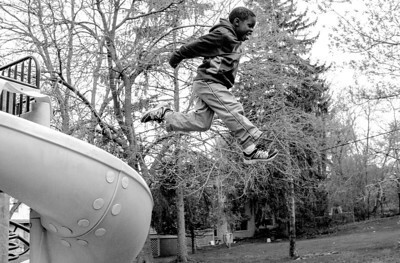 Sarah Nader- snader@shawmedia.com Lamar Ostenhues, 5, of Tower Lakes jumps off a slide while playing at a park near his Tower Lake Home Wednesday, April 29, 2015. 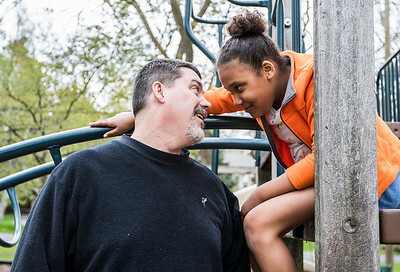 Sarah Nader- snader@shawmedia.com Mark Ostenhues of Tower Lake and his daughter, Emily Ostenhues, 9, have a discuss about school while playing at a park near their Tower Lakes home Wednesday, April 29, 2015. Ostenhues fostered each of their children before later adopting them. Sarah Nader- snader@shawmedia.com Emily Ostenhues (left), 9, of Tower Lakes and her mother, Carolyne Ostenhues, play at a park near their Tower Lakes home Wednesday, April 29, 2015. Ostenhues fostered each of their children before later adopting them. 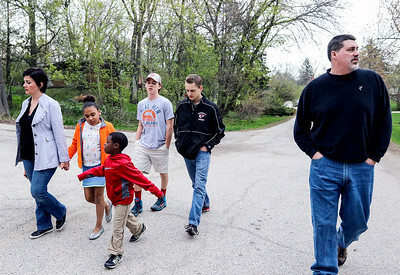 Sarah Nader- snader@shawmedia.com Carolyne Ostenhues (left) and her family, Emily, 9, Lamar, 5, Colby, 14, Kyle, 16, and her husband, Mark, walk to a park near their Tower Lakes home Wednesday, April 29, 2015. The Ostenhues's fostered each of their children before later adopting them. Sarah Nader- snader@shawmedia.com Carolyne Ostenhues (left) and her daughter, Emily, 9, and husband, Mark, play at a park near their Tower Lakes home Wednesday, April 29, 2015. The Ostenhues's fostered each of their children before later adopting them. 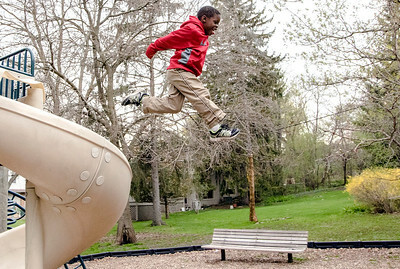 Sarah Nader- snader@shawmedia.com Carolyne Ostenhues pushes her, daughter, Emily, 9, and son, Lamar, 5, while playing at a park near their Tower Lakes home Wednesday, April 29, 2015. Ostenhues fostered each of their children before later adopting them. Emily Ostenhues (left), 9, of Tower Lakes and her mother, Carolyne Ostenhues, play at a park near their Tower Lakes home Wednesday, April 29, 2015. Ostenhues fostered each of their children before later adopting them.